Three days in and I’m beginning to see realize that commitment and consistency are really all in the mind. Today when I woke up I just felt lazy and was completely ready to make an excuse for myself. But I remembered that I have a blog now and at least 3 people who I mentally feel are holding me accountable so I got up and got to work. My plan was to do 30 mins of TAM toning video (Abs and legs) that I talked about in Episode 2 and 15 mins of TAM dance cardio. I successfully completed the toning video but was unable to find the YouTube TAM Dance cardio I used to watch. So I found, instead, a 5-minute version that she made for GOOP. This version was a little challenging to learn in 5 mins, especially because the pace she teaches the dance is about 4 times slower than the pace at which the dance is performed. However, it’s what I have to work with now during my 21-day test in consistency so I’m going to make it work and I’m sure I’ll get it over time. 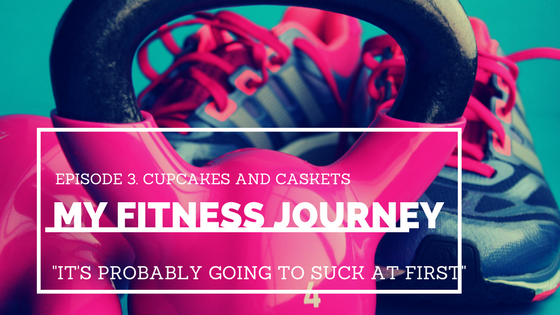 My workout went pretty well and I’m still getting the hang of things so I look forward to seeing my progress this time next week!….Now, at this point, I’m sure you’re wondering why I’ve named this episode cupcakes in caskets…well…gather round for story time!!!! After I finished my workout I had to go a pickup cupcakes from one of my favorite bakers in our county. She used to have a shop in the center of town but she wasn’t able to stay in her lease and is, as a result, a bit of a nomad baker right now. Undeterred by her lack of dedicated space I sought her out to have her make cupcakes for my hubby’s birthday party. We made all the arrangements through messenger and when she told me that I could pick up from a local church no major red flags arose. As I got ready to leave my house I thought about changing my clothes but figured it was better to be on time than to be clean so I hopped in my car and off I drove. Upon arriving at the church I could immediately tell something was off. For starters, there were people there who were dressed in Sunday’s best (mind you, it was Saturday morning); but I, nevertheless, pulled into a spot, parked my car and tried to call the baker to find out where I should meet her. She didn’t answer the phone but as I looked around I realized that there were a fair number of people in black and there was a black stretch limo parked in front of the building. I began to feel super anxious but was not going to leave my cupcakes behind. So I mustered up some courage and got out of the car. I saw a couple standing around talking who seemed safe to talk to so I asked them if they knew anything about a bakery at the church and they did not but directed me inside to talk to a church elder. Oh, did I mention that this was a tent church…. So I was super confused about where the main entrance was because unlike the picture above, there were no windows, there were multiple tents pieced together, and the last thing I wanted to do was enter in through the wrong door. I gathered the rest of my courage and walked past several groups of church ladies who I’m sure were totally confused why I was dressed for the gym while they were dressed for a different, more formal, event. I quickly walk into the building and am able to quickly find and pay for my sweet treats. I then turn around to hi-tail it back to my car. However, on my way out I’m greeted by a site that will make this experience all the more memorable. As I’m speed walking to my car and out of the building I see an open casket and I then realize that the sharply dress church attendees were confused by my presence (and my outfit) because they were there for a FUNERAL! And I filled with shame and embarrassment rode off into the sunset and enjoyed a mouth full of carrot cake and cream cheese frosting flavored shame. With all of that being said and understanding how absolutely mortified I was and still am, the lesson that I am choosing to take away from this experience is that on days when I’m struggling to get out of the bed and/or be consistent in working out, I will remember that it really is such a blessing to still be in the land of the living with the ability to make positive changes in my life and lives of others. It is such a blessing to still be in the land of the living with the ability to make positive changes in my life and lives of others. Although I don’t think I needed to crash a funeral carrying cupcakes in order to learn that lesson, I am thankful for it none the less.